Over time, your driveway and patio can start to look a bit dull, the colour of the block or stonework loses some of its colour, and no amount of washing it down with a hose and scrubbing seems to make any difference. 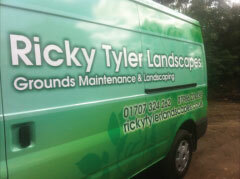 This is where Ricky Tyler Landscapes can help, with our professional driveway and patio refurbishment service. Our team of fully trained ground maintenance staff can get your driveway or patio area looking back to its best again, and also protect it for years to come. Our driveway and patio refurbishment service. We specialise in cleaning paved and block driveways and patios using modern equipment and materials designed to clean the surface area without damaging it in any way. In fact, once the cleaning is complete, we use a special sealant that not only protects the paving from future wear and tear and extends the life of the driveway, but also keeps it looking spick and span! Before sealing the surface, we wait until it is thoroughly dry and then repair or replace any part of it that has crumbled over time, or been displaced during cleaning. The next stage is applying a double coat of acrylic sealer. Customers are frequently amazed when they see what a difference our professional cleaning makes to the appearance of their patio or driveway. The true colour of the original paving is restored and sealed in. 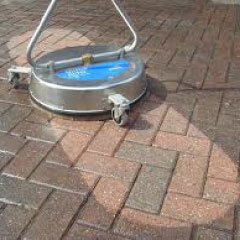 Not only does it look better than ever, cleaning your patio is also easier because of the special coating we apply. This is a great way to protect the investment you’ve made in your property and be the proud owner of a beautiful looking patio or driveway again. Our fully equipped and uniformed teams are highly visible in our branded fleet of vehicles that operate in and around London and Hertfordshire. To find out more about how we can refurbish your patio or driveway, please contact us today for a free, no-obligation quote. Ricky Tyler Landscapes can provide gardening and grounds maintenance services including Driveway and Patio Refurbishment covering London, Essex, Hertfordshire, Northampton, Buckinginghamshire & Bedfordshire .